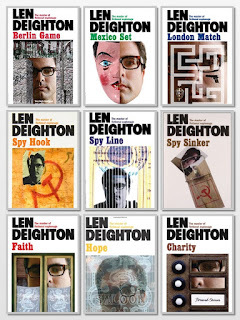 Amongst the carton load of books that we bought at the ‘books by the kilo’ thingy in Bombay, was a Len Deighton book. My only encounter with Mr. Deighton before this has been in form of the Michael Caine movie based on Deighton’s book - “The Ipcress file”. The fantastic movie that launched Michael Caine as an actor and Deighton’s writing career. The book that I had picked up to read, by pure chance, was “Berlin Game”. It was a lucky break, I did not know that this was the first book in his trilogy of trilogies a series containing 9 books. I had picked it up just by chance from a pile of books. The Berlin Game, narrated by the protagonist Bernard Samson and set in the cold war era, was just the kind of spy novel that I like to read, a far cry from the charismatic and unrealistic James Bond type of spy. More in the Le Carre universe than that of Fleming. The book had everything, a super interesting protagonist. The beautiful Fiona, his wife, with ambiguous morals. A wonderful setting, Berlin and interspersed with characters who were very well defined. I finished the first book and HAD to read the next one, which I hunted for all over Pune. Eventually I bought it on Amazon Kindle and read it on my iPad, “Mexico Set”. From there on, the 9 book series has been an addiction that has demanded my utmost attention. I got through the series in a month, a month that had me at work 12-14 hour days, 7 days a week. But I had the books to look forward to after a tiring day at work. There is a type of melancholy that descends upon you when you realise that you’ve finished reading everything that an author has to offer and that there will be no more of the same. I am sure there is a word somewhere in some language to describe that feeling. I felt this first, when I had gotten through Colin Dexter’s novels, featuring Inspector Morse. When the 13th and the last book was done, I knew that I would never feel the joy of reading a brand new Inspector Morse book. This is the same feeling I get now, as I realise, that while there is a lot of Len Deighton that I haven’t read, I will never again read a Bernard Samson book. However, better to have read the books, than not have discovered them at all! It is a wonderful wonderful series, very well crafted, with wonderful characterisation. It has enough twists and turns to keep you on the edge and each book leaves you asking for more. I strongly recommend this, and recommend that you read it in order - Game, Set, Match followed by Hook, Line, Sinker and ending with Faith, Hope and Charity. Does anyone else find Bret's conversation with Bernard at the end of Charity staged? What has Bret ever done to generate trust? It seems to me to be something he is orchestrating with Fiona to help her keep Bernard from successfully pursing Gloria. Bret's willing to marry Gloria (not much of a sacrifice but a poor end for her). It will allow Fiona to pursue her work and maintain the guise of a family and enter into any attractive romantic liasons that come along as she has done in the past. It's a shame that Bernard faces such a bleak future. It makes sense of Deighton's decisions to end the series with Charity.